On this edition of Barn Find Friday, I'll show you five of the best dusty treasures found in barns, garages, and fields, that were made in the good ol' US of A. Get your smelting gloves on, because you're about to see some gold. This Chrysler LeBaron Wagon has so much faux-wholesome Americana oozing out of every hand-sized panel gap that you may as well legally change your name to Clark W. Griswold. This car has an original 24,000 miles, with it being in nearly pristine condition, despite having sat for over 30 years. This 318 cubic inch V8 is good for a 0-60 miles per hour time of eventually. But who cares? It's less than $4,000 as of now. Put all your friends in the back, your least favorite in-law on the roof, and jam out to Holiday Road. The '60s were the time when muscle cars what made the hearts of regular men and women skip a beat. They were more powerful, more imposing, and more aggressive than anything Europe had to offer for any price. That's why this 1968 Pontiac Firebird with numbers matching engine, is a steal at a four-figure price. It's a window through time, when cars were made with a certain weight and toughness that you can't get with anything made in the past few decades. At A $4,000 starting bid with a little bit of time left, it's worth a snipe to get an awesome vintage muscle car that needs a little TLC to be brought back to its former glory. In the '50s, Chevy's Bel Air was un-freaking-stoppable. It was so ubiquitous and desirable that they still command a premium today, fetching six figures for an original or immaculate restored model. Ford, however, had this Bel Air Fighter, called the Fairlane Victoria. This example needs a little bit of fixin', fettlin', and general lovin', but it wshould be one of the best looking '50s cars ever made when all is over with. It's an under-appreciated classic, and that's the reason you can have it for $7,500 in its present state. It's a cheap price to pay for a rose-colored stroll down memory lane. Jay Leno has a story where he once convinced his parents to buy a '66 Galaxie, with his father quickly getting a speeding ticket after purchase, proclaiming that the car was "a rocketship." You too, can own a rocketship in the form of a rare 1966 Ford Galaxie 500 with a 390 cubic inch V8. 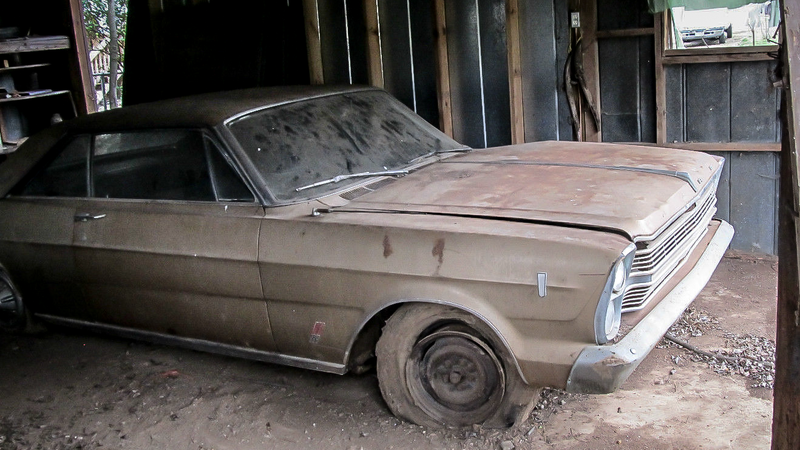 This is as true-to-life barn-findy as it gets, as the car sat for more than three decades. For a numbers matching big body coupe, it's one of the best deals you'll find for a long time at a $6,500 asking price. Get it before Jay does.